Recuva is a free file recovery program that makes it extremely easy to locate files that were once thought to be lost forever. The wizard-like approach and intuitive user interface will appeal to all user levels. 1. 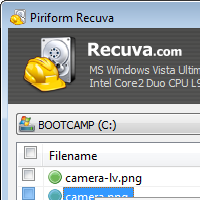 Download Recuva by clicking here , install and run the program on your computer. 2. A welcome screen will appear. Click Next to proceed. 3. It will ask you which kind of files you are trying to retrieve? select the file type you wan't to recover and click Next. 4. In next step is to choose the Drive in which your file was accidentally deleted by you. 5. In next window click start, it will start scanning process from the directory and after completing process it will show you deleted files in next window. 6. Select the location where you want to save that recover file.